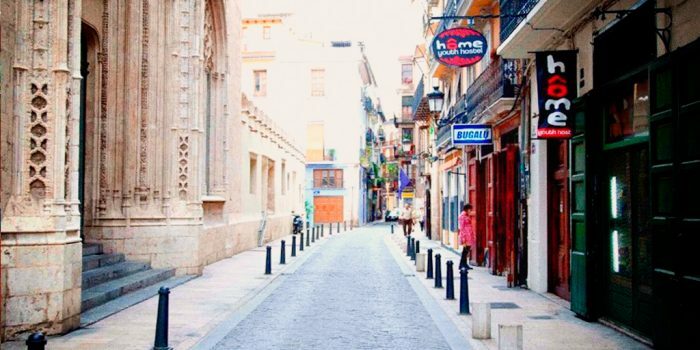 Home Youth Hostel is a hostel in downtown Valencia, not far from the train and bus station and only a few steps from the Mercado Central (Central Market) and La Lonja (Silk Market), two very important tourism spots in Valencia. 15 minutes. From the main exit of the train station Valencia Nord walk straight ahead to the Plaza del Ayuntamiento. Walk past the fountain (leaving it on your right) until you get to the end of square. Take the Avenida Maria Cristina located to your left untill you reach the Central Market. On your right you´ll see the old silk market “Lonja de la Seda”. Take the steps next to the Lonja. At the end, just before you reach the Plaza del Collado you´ll see on your left Home Youth Hostel. 1) Outside at the main exit you´ll see a yellow bus, which takes you to the train station “Valencia Nord” for free with your train ticket. Runs every 10 minutes during whole year. 2) You can walk 15 minutes following the tracks until you reach the train station Valencia Nord. From the main exit of the train station Valencia Nord walk straight ahead to the Plaza del Ayuntamiento. Walk past the fountain (leaving it on your right) until you get to the Citibank. Take the Avenida Maria Cristina located to your left untill you reach the Central Market. On your right you´ll see the old silk market “Lonja de la Seda”. Take the steps next to the Lonja. At the end, just before you reach the Plaza del Collado you´ll see on your left Home Youth Hostel. 3) Outside at the main exit turn left and go to the street Calle San Vicente Martir. There take the bus number 27 until Mercat – San Ferrer. When you go off the bus you will see the Central Market and in front of La Lonja, the old Silk Market. Take the steps next to the Lonja. At the end, just before you reach the Plaza del Collado you´ll see on your left Home Youth Hostel. Take bus n.28 outside the bus station and get off at Plaza de la Reina. On your right you´ll see a McDonald´s. Take Calle Correjería until it finishes; then turn left for Calle de la Purísima. 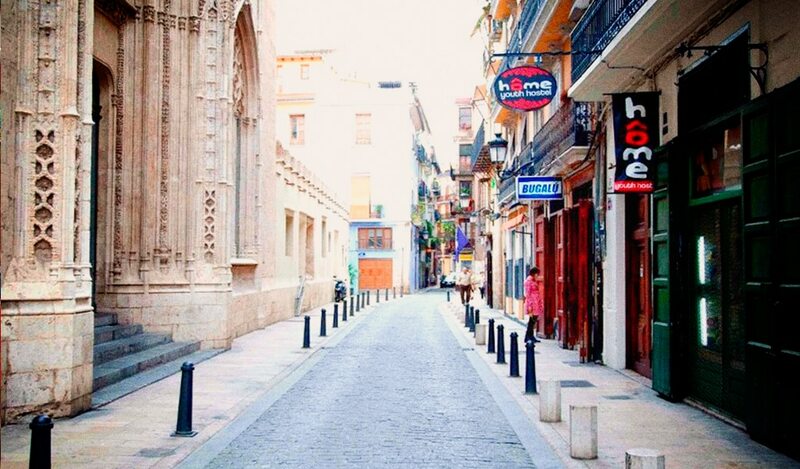 Go straight for Calle de la Estameñería Vieja until you reach a little square called Plaza del Dr. Collado. Once on the square, you´ll see Café Lisboa and Bar El Kiosco. On an opposite building you´ll see the Home logo. The hostel entrance is on the left hand side of this building. Ring the bell and enter to our hostel! Once outside the port, go straight towards Avenida de Francia (5 minutes walk) and catch bus n.19. Get off at Plaza del Ayuntamiento (the main square). Walk past the fountain (leaving it on your right) until you get to the Citibank. Take the Avenida Maria Cristina located to your left untill you reach the Central Market. On your right you´ll see the old Silk Market “Lonja de la Seda”. Take the steps next to the Lonja. At the end, just before you reach the Plaza del Collado you´ll see on your left Home Youth Hostel.